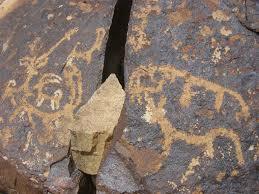 For the record it is humanity’s most ancient and oldest traditional practice. Humanity has been honoring their dead ever since the first man and woman wondered what happens after death. In fact, the caring for the dead is one of the significant factors that distinguish human being from animals. Although animals do grieve for their dead, animals lack the mental capabilities of caring for their dead as human beings do. This is why human beings are the only species on the planet that perform elaborate rituals wishing that their dead find peace in the hereafter. That being said, any sect that does not abhor or support this basic essential human practice is a cult that is not only created to control and dominate your thoughts in the living (and in death), but is also trying to deny you of your humanity and ultimately your free will. Let me explain. The most powerful organ human beings have is our mind, which consists of a superconscious, subconscious and conscious. Although, the mind is composed of these three parts, technically speaking there is only one mind, it just moves into these three states of awareness. For instance, right now you are consciously reading this post, while subconsciously your heart is pumping blood, which transfers oxygen and vital nutrients throughout your body; as ideas superconsciously pop into your awareness. Hence the human being is kingdom within. So, when the first human beings died, their loved ones were at a loss because they had never encountered death. All they knew was that there was a great emptiness and sorrow that they felt. Every culture around the world experienced this same loss when they first encountered death and described pretty much in the same way how they coped with this strong and painful emotional that they felt. Many cultures, including the Kamitic culture explain that the early human beings not understanding how to clearly express the sorrow they felt in death and the desire in their heart for their loved ones to be a part of them, resulted to cannibalism. Understand that ritual cannibalism was humanity’s desire to express that one’s deceased loved one was a part of them. It was an extension of the hunting ritual in which a hunter consumed the heart of an animal to absorb its’ prowess and strength. This is the origin of the Eucharist or Holy Communion, which is the most important religious ritual practice in Christianity. It is not officially known why ritual cannibalism fell out of practice. It is believed most likely that the tradition fell out of practice due to the rise of transmitted diseases (most likely through pests and rodents) and/or the lack of relics that could be shared by the living, which consequently resulted in humanity mummifying, burying and/or burning their dead. (It should be noted that the reason a few cultures continue to burn the body of the deceased is because they have not consciously evolved past the ancient global belief regarding the dead. 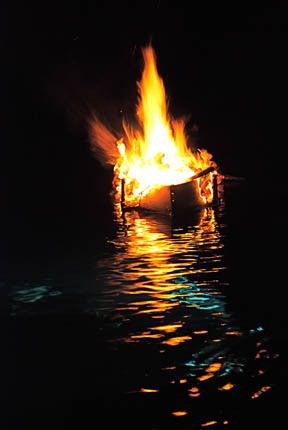 Some more evolved cultures on the other hand reserved the burning of the deceased body to members of nobility in order to ensure that relics were not stolen from their enemies. The last thing one wanted in ancient times was to fight an opposing tribal clan who possessed the skull, right hand or femur bone of a beloved dead leader. The psychological impact of such occurrence would have been devastating).Whatever the case, a new way of wishing the dead peace was needed to relieve humanity of the horrendous emotion caused by death. Consequently, enters religious thought to address the haunting question what happens after death. Some scholars I have noted will try to claim that Kamitic people worshipped death but, these are individuals with a limited understanding of the human psyche. The idea behind the conception of the soul meant that human beings no longer needed to consume the flesh or take a relic in order to relieve themselves of the emotional pain caused by death. All they needed to do was to physically acknowledge and respect death by providing a memorable burial either by burying and or mummifying their dead, which signified that their loved one was indeed physically dead. If they were still consumed by the heavy burden of grief, they could remember their deceased loved ones in thought. Technically speaking, because the dead do not have a physical body they cannot be hungry or thirsty since food and drink is meant to sustain the body that they no longer possess. The belief that one’s ancestors are hungry and thirsty is simply an individual’s way of coping with the death experience. The idea behind saying that one’s ancestors are hungry and thirsty is to remind an individual of the reason why they should continue to live because of the sacrifices that other’s made for the benefit. 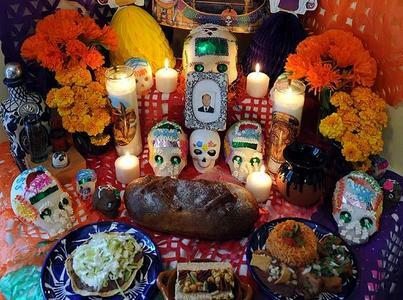 Now, some cultures like the Africans and many of their descendants, many Asian and Latin Americans take the remembering of the dead a step further because they understand the psychology behind the practice. It is in their celebration of death, that you see from a reverse psychological perspective the beauty of life and vice versa. This is because since we all will physically die one day, most of us do not fear death. We have been comforted by the belief that our soul will continue to exist after death, so we do not fear death. We do however fear how we will die. Will we die peacefully in our sleep or painfully kicking and fighting as we are dragged off to the other side? So, many Africans and Asians continued to explore upon the concept of death in an effort to relieve us of the burdensome question of how to secure a glorious afterlife. It was discovered for some that they need to honor their dead every day, while others only needed to honor their ancestors once a month or a year. 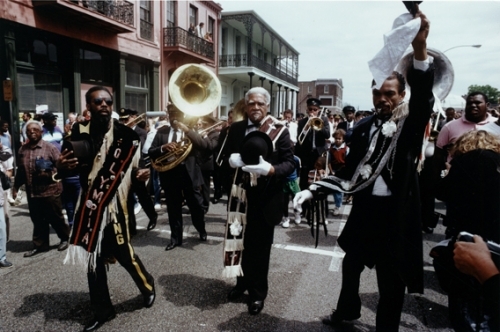 In some cultures, honoring the ancestors was the responsibility of the head of the household usually the men (or the eldest son) since traditionally it was the men who maintained law and order. In other cultures, it was the responsibility of gifted men, gifted or barren women, who viewed as shamans, because of their responsibility to guide the tribal community. 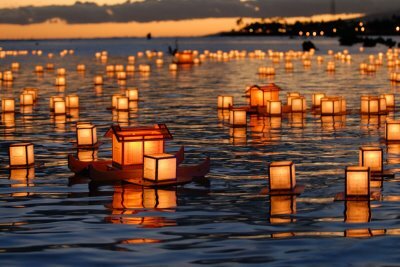 All of which, later developed into a cultural practice, which is the reason there is no right or wrong way to honor one’s ancestors and one does not need to belong to a particular religion to honor his or her ancestors. Honoring one’s ancestors is a human spiritual tradition. The cultural practice that developed was to put one’s mind at ease by ensuring that their ancestor was at peace if they sense were not forgotten, remembered for his or her honorable deeds, and believed to continue to be a vital member of the community. 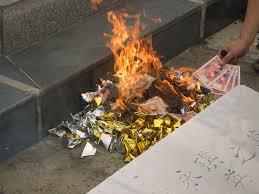 Hence the rituals that developed from this understanding, was the offering food and drink to the ancestors, burning money for their ancestors so that they will enjoy their afterlife, and so on. 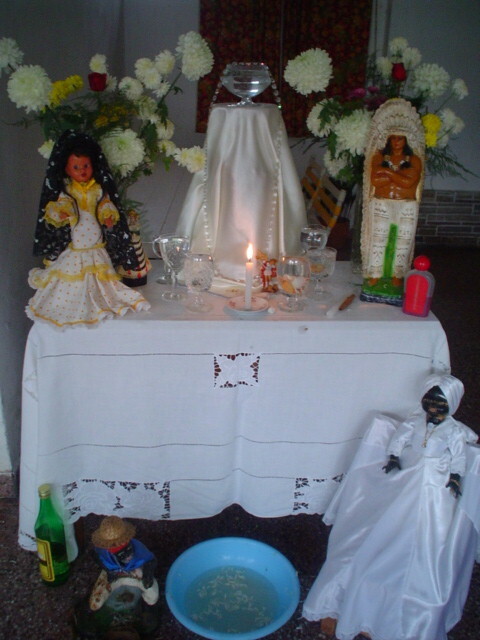 For the same reason, those who honor their ancestors, altars reflect what they believe the afterlife will be for their deceased loved ones and them in return. 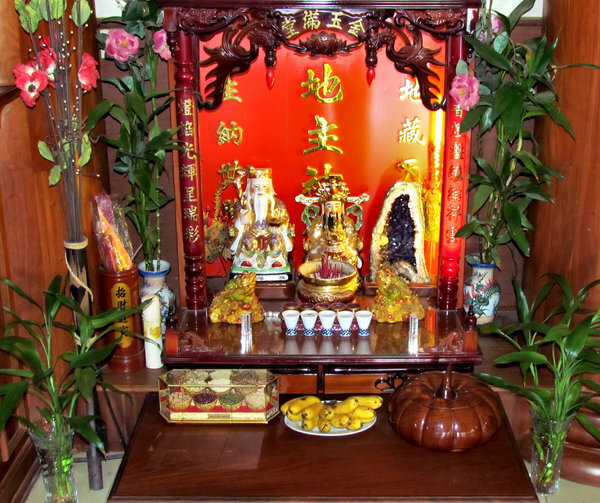 Many Asian ancestor altars like African and African descendant altars are usually either close to the floor or mid – ranged level, consisting of foods and other gifts that the dead will enjoy. 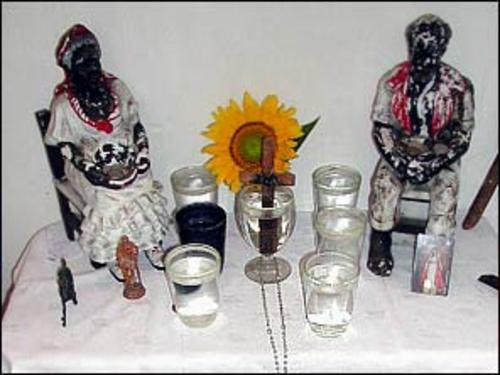 My own altar is a reflection of my Kamitic and Kongo inspired beliefs, indicating that when I physically die my soul will return to the house or village where all my deceased loved ones dwell. I will be able to see my grandparents, great uncles and aunts whom I briefly met in life. As you can see, this is a non-Western cultural thought, which is not taught but developed as a result of honoring the dead. In addition to this, many believe that if the ancestors are well taking care of they will in return assist the living. This simply means that the ancestors will relieve them of the emotional pain – particularly fear – brought upon them by death. In other words, after honoring one’s ancestors one should be happy or feel at peace, because in the process or remembering one’s ancestors, they are being reminded that they are spiritual being that is having a physical experience. And, in the end, because they honor the living memories of those who died before them, they will have a glorious afterlife as well. This is the reason most people who honor their ancestors do not fear death. Many will attest that they are more courageous because they feel that their ancestors protect and guide them from danger. The general belief or explanation is said to be that the ancestors continue to have an interest in the life of the living.